I couldn't resist. I had originally cast on for a pair of socks in Classic Elite Alpaca which I've had tempting me in my stash for a very long time. Alas I got down to about the heel point before realizing that it was simply too small for my feet to fit into. So that yarn is going to have to wait until I can get myself some slightly bigger DPNs. 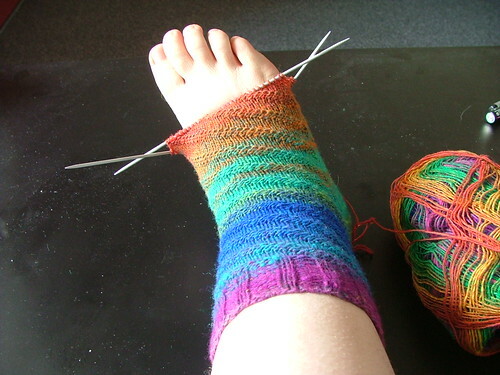 This did, however, give me a -perfect- excuse to rip all that back and begin something with my new Noro sockyarn. I've been scouring Ravelry, now officially my -favorite- site of all time, and found another woman's gorgeous RPMs done in Noro and her comment was simply, "This yarn was made for this pattern." And well, how can you pass that up! 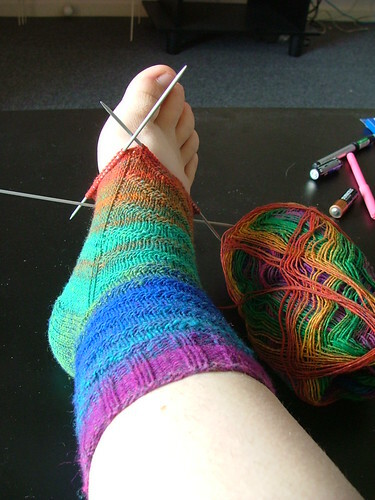 I'm more then halfway done with the first sock and I can only agree whole heartedly. This pattern is brilliantly designed and such a fast knit! Also typical to Noro there were two great big knots in the yarn, booo! Not only annoying to deal with but also caused a minor color change (you can see it in the sock where it goes from teal to a thin stripe of orange/teal and then BACK to teal and then back again to orange-teal. It's minor but still... I can't see any other knots in the near future, at least. It's also very scratchy, not very nice to touch (unlike the Classic Elite Alpaca, now THERE is a soft sock yarn..) but I'm surprised at how much the fabric has softened up just by knitting, and all reports on Ravelry says that it will soften up yet more after a wash or two. While waffling about which pattern to do before settling on RPMs I cast on a quick and fun knit to keep me occupied in the meantime since apparently I am unable to go without SOME sort of sock project on the needles for long. 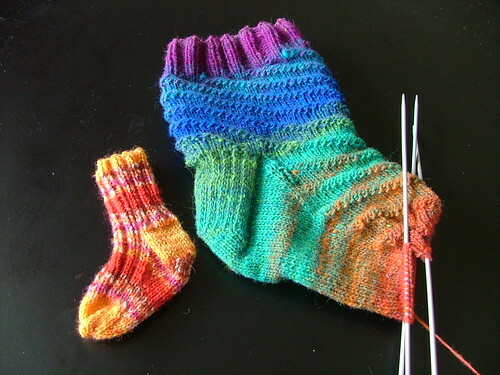 These "Leftover" Baby Socks are a great way for me to use up an odd ball of leftover sock yarn or two. Simply designed yet look quite nice. I only got one done before I couldn't resist casting on for the Noro, so I think I might quickly knit up a pair to this little beauty before making the pair to my RPMs... we'll see! I've given myself a goal though; I need to finish this project completely before I start on the lovely Bendigo Mills Wool.. Socks I can handle in bigger amounts since they're small, relatively quick projects, I think one sweater at a time will be good... plus hopefully it'll give me the drive I need to actually finish the bigger projects!! Okay, Okay... back off to that stupid paper. Hee! That's a really good idea. 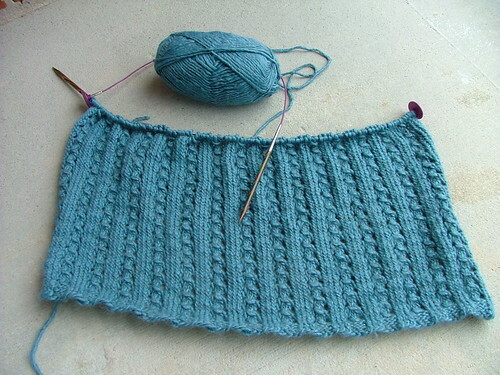 I also tossed around in the back of my head knitting four baby socks and seeing if I could talk Chris into putting them on Mae Bell, but although it works brilliantly in my head, would most likely be a Very Bad Idea to try in real life. Alas. The yarn is... okay! It's honestly the strangest sock yarn I've knit with so far, it didn't actually manage to snap on me like I feared, and the final knitted fabric actually seems pretty sturdy! It's still pretty rough, but luckily my feet just aren't that sensitive so they just make a good warm sock so far, and absolutely gorgeous to boot! We'll see how it lasts though after a couple wears.. still gotta knit another one yet. *snickers* I decided two new second cousins at once was one too many!